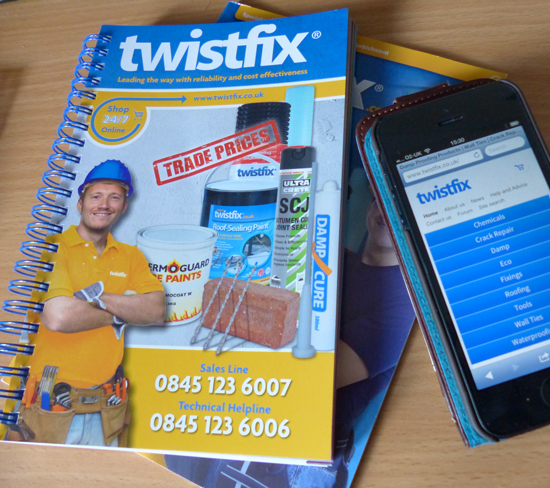 We are excited to announce that the brand new Twistfix Catalogue is now available. Packed full of great prices and stuffed with professional tips on specialist products for construction and renovation; be sure to order your FREE copy today. 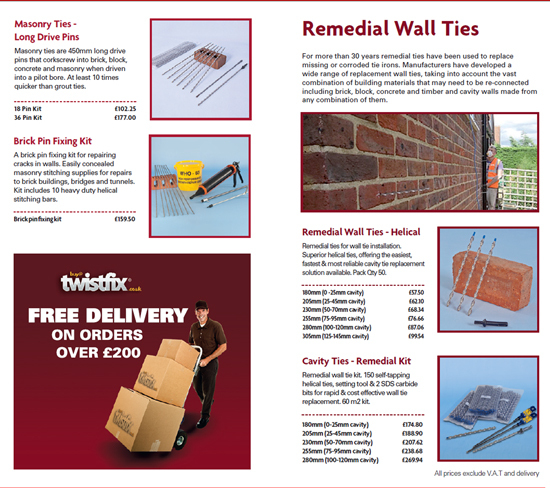 The catalogue features more than 130 pages of useful information from Twistfix, attractively bound with a durable wire spine. All of the latest products that have been added to our extensive website will be detailed within the comprehensive booklet which will quickly become a must-have for every builder's van and office. Also included are several handy coverage tables to be used for calculating the correct amounts of product to be used in surface coating, chemical treatment and damp proofing injection applications. As these are such important processes, calculating correctly is of paramount importance and these handy tables will save time and money. New to the catalogue are a series of 'Twistfix Tech-Specs'; professional guides to solving some of the common issues associated with the construction, repair and renovation industries. 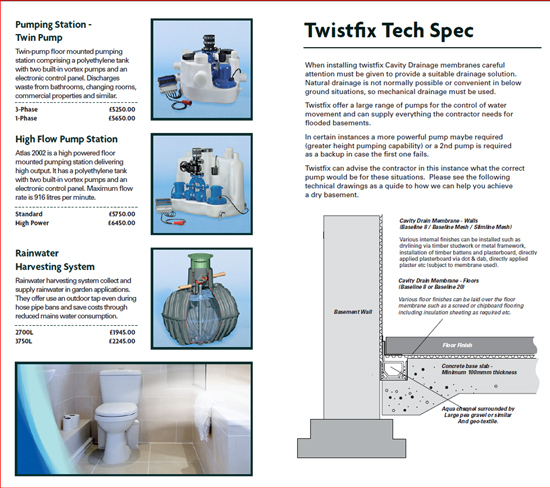 Many of these specification guides have been included within our fantastic new brochure, including those related to retro-fit wall ties, masonry repairs, basement tanking systems and the identi­fica­tion of different woodworm species. Building repair treatments should always be carried out to the highest standard and our Tech-Spec guides give clear,­ concise advice for the professionals using or specifying property repair products and systems. As well as being available in a sturdy printed version, we have also made this invaluable catalogue available electro­nic­ally. This is in order to continue with the Twistfix commitment to providing the highest levels of convenience and customer service to our diverse client base. We look forward to sharing our new catalogue and invite your comments, questions or suggestions. 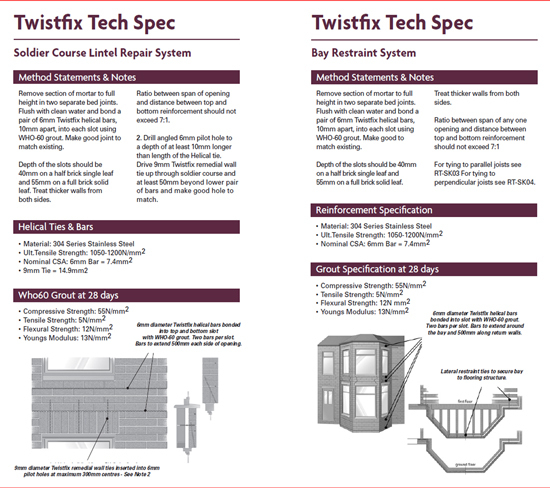 For further information on the Twistfix range of insulation anchors, damp proofing, crack stitching and other masonry repair products, please contact our skilled team on 0845 123 6006 or email us at sales@twistfix.co.uk.